Details will be posted shortly. 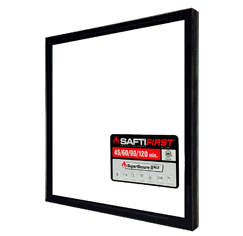 Contact SAFTI FIRST at 888.653.3333 for immediate assistance. The only wire-free, fire resistive rated security glazing to meet CDCR (California Department of Corrections & Rehabilitation) 860-14a testing requirements and ASTM F1915 Grade 1-4. Meets ASTM E-119/UL 263/NFPA 251 requirements with hose stream. Largest tested and listed sizes for wire-free, fire-resistive rated security glazing. 45 - 60 minutes Doors, Sidelites, Windows, Transoms, Walls 4952 in² 96" 96" 1"
90-120 minutes Doors, Sidelites, Windows, Transoms, Walls 4876 in² 96" 96" 1"
*Please call SAFTI FIRST for custom sizes exceeding 96" up to 124". Please see our Quality Specifications and Inspection Standards. Fire Rating: Must be fire rated from 45-120 minutes with hose stream and meet ASTM E-119. ASTM F1915 Grade: Must meet Grade 1-4 per ASTM F1915. Impact Safety Resistance: CPSC 16 CFR 1201 Cat. I & II. SuperSecure II-XLS is listed and labeled by Intertek/Warnock-Hersey Inc., a nationally recognized testing laboratory approved by OSHA. UL 9, UL 10B, UL 10C, UL 263, NFPA 80, NFPA 251, NFPA 252, NFPA 257, ASTM E119, ASTM E152, ASTM E163, ASTM E2074, ASTM E2010-01, ASTM F1233, CPSC 16 CFR 1201 Cat. II, CDC 860-14a, ASTM F1915.